Do you work for CreditMiner? Claim your company page now! CreditMiner is the automotive industry’s only Real-Time pre-screen provider, giving dealers simultaneous access to bureau data. It’s proprietary software platform provides the industry with permissible full file bureau data. 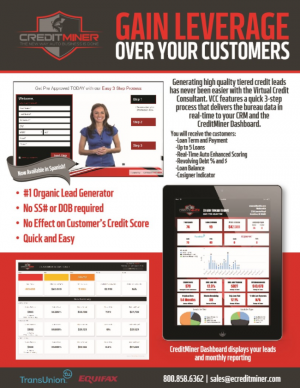 CredtiMinerSM is integrated into the Virtual Credit Consultant, DeskMiner, eAutoAppraise, and most leading CRM.